Solvang, Healdsburg, and other Golden State spots made the internationally flavored roster. Solvang is featured in the new National Geographic book "Abroad at Home." Look for several distinctive, internationally flavored California towns and neighborhoods within its pages. FREMONT: The Bay Area burg's Little Kabul throws a big party every spring when it welcomes the Afghan New Year, NowRoz. National Geographic also loves the savory eats of the area, from naan to kabob-e-gousfand -- lamb kebobs -- to onion-and-beef pastries called manto. Naan eating contests, by by the by, are a festive part of the festive New Year celebrations. 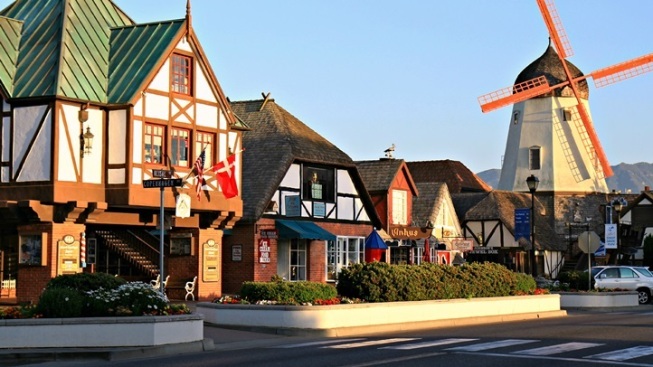 SOLVANG: It's no surprise that "the Danish capital of America" got a special shout-out. Rasmussen's boutique, Danish Days, and those hard-to-stop-eating aebleskivers all received the Nat Geo love (love enhanced by a warm, windmill-y photo from local photographer Tenley Fohl). GRASS VALLEY: The northern end of Gold Country is packed with storied ways from far-off shores, but Grass Valley's background is very much about the Cornish tin miners who settled in the region decades upon decades ago. On the book's rec list? Pasties at Cousin Jack and Marshall's and the annual Cornish Christmas celebrations. LOS ANGELES: Several distinct neighborhoods are featured, from Koreatown to Boyle Heights to Chinatown. The other larger cities get shout-outs for their distinctive shop-lined streets and restaurants -- Sacramento, San Francisco, Anaheim, and San Diego all have vibrant presence in the book. Truly, it is the best to travel abroad, for many excellent reasons, but getting to know the world close to where you reside is a rather wonderful opportunity, too.